Home | The italian campaign and the C.E.F. The general public know little or nothing about the Italian campaign or the Battle of Monte Cassino and the fighting at Belvedere. The campaign was, however, one of the longest and most difficult of the Second World War. As Jean-Christophe Notin explains in his book “La Campagne d’Italie – les victoires oubliées de la France“, the Italian campaign has a bad reputation. Wished for by Stalin and the result of Churchill’s powers of persuasion with Roosevelt, it was often considered by many historians – and sometimes by the soldiers who took part – to be unnecessarily violent, costly in men and debatable in strategic terms. A profound disagreement separated Roosevelt, who was opposed to operations in the Mediterranean, and Churchill, who wanted to take Germany in a pincer movement, attacking in the North West and the South of Europe. It was only in May 1943, at the Trident conference, that the two men reached an agreement about the operations in Italy. 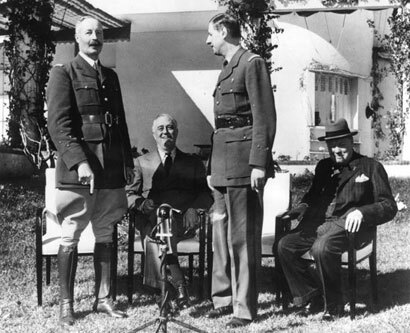 The precise details were agreed a little later at the Quebec conference in August 1943. The Allied landings in Italy began on 3 September 1943 in Calabria (operation Baytown). A few days later on 9 September 1943 an British-American force led by General Clark landed at Salerno (operation Avalanche). The Germans fought fiercely, launched several counter-attacks and then slowly retreated towards the north. Naples fell only on 1 October 1943. The Allies continued their slow progress to arrive at the Gustav Line and the notorious “bolt” of Monte Cassino in January 1944. This marked the beginning of the battles that historians have named the Battles of Monte Cassino, which lasted for nearly 5 months from January to May 1944. The Battle of Belvedere was one of the Battles of Monte Cassino. It was linked to what is sometimes called the first Battle of Monte Cassino which corresponds approximately to the Allies’ first month of fighting at Cassino. It is generally thought that the first Battle of Cassino came to an end with the bombing of the monastery of Monte Cassino (15 – 17 February 1944). The Battle of Belvedere was therefore a relatively brief episode in comparison with the whole Italian campaign. The battle was fought solely by the French army, on the orders of General Mark W. Clark. It was, without doubt, the most spectacular and perhaps the most violent of the Italian campaign, given the enormous losses sustained by the French, Tunisian and Algerian troops. The Battle of Belvedere was one of the battles fought by the French Expeditionary Corps (C.E.F.) in Italy. The C.E.F. 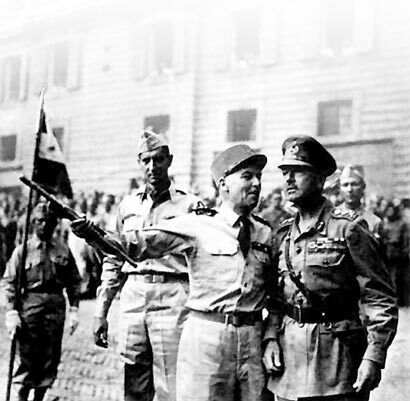 played a very active role within the Allied army in Italy, which consisted mainly of American and British troops. Although it included several divisions of Free French, it is important to understand that the C.E.F. derived essentially from the African Army, which was totally reorganised after the Casablanca conference and the setting up of the Anfa Plan by Roosevelt and General Giraud (14-24 January 1943), who deserved most of the credit for the plan. His insistence in dealings with the Americans was unwavering, and in order to make a more forceful impression, his statements sometimes bordered on the basic “Just give us weapons!” he was heard to shout at Roosevelt. The rearmament of the African Army was slow; not due to reluctance on the part of the Americans, but because technical information had to be translated into French, instructors sent to North Africa, training organised, etc, all of which took time. In addition, the American army was only just able to cover its own needs. In consequence, it is difficult to blame it for not satisfying the needs of the African Army immediately. During the first half of 1943, the French did not always make a very good impression on the Allies. The conflict between Giraud and de Gaulle exasperated Roosevelt and Churchill (who referred to de Gaulle as their “problem child“). This dispute was not without repercussions at the level of the soldiers, and the behaviour of the Free French vis-à-vis the African Army, which was suspected of sympathising with the Vichy regime, did not make things any easier (poaching, intimidation, etc). The first Free French Division refused in particular to march alongside the African Army at the end of the Tunisian campaign on 20 May 1943. And so the merger of the African Army and the forces of the Free French only became effective on 1 August 1943 and was not without second thoughts on both sides. Juin was appointed Commander-in-Chief of the new army. Indeed, the historical facts cannot be ignored: the creation of the C.E.F. and the participation of the African Army in the Italian campaign and, later, in the Provence landings, owed little to the Free French or to General de Gaulle. The Americans were still backing Giraud at the beginning of 1943 but without much conviction. He is a hopeless administrator. He will be a hopeless leader. Giraud also made some surprising remarks that did not always inspire confidence among the Allied leaders. In Casablanca, for example, he said that Corsica and Sicily could be taken within the next two months while the British and Americans did not envisage landing before the month of August. Yes, General, but don’t forget you were taken prisoner twice. 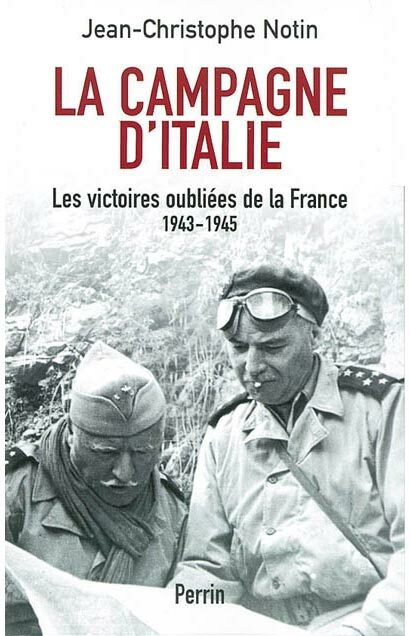 It was only in the summer of 1943 that the Allied general staff envisaged using French troops in the Italian campaign. The process that brought the C.E.F. into the fighting was long and hazardous for the French general staff based in Algiers. The decision owed much to the obstinacy of General Juin. The defeat of 1940 did not recommend the French as allies and many British and American officers considered the addition of French troops to their own forces as totally pointless. When operation Avalanche was launched at Salerno, on 9 September 1943, there were no Frenchmen in the landing craft. But the French spared no efforts: the general mobilisation in French North Africa after operation Torch produced a contingent of 176,500 men, or 16.4% of the total French population of French North Africa (a higher proportion than that recruited in metropolitan France in the first World War). The indigenous population provided 233,000 men, or 1.58% of the population. The C.E.F. could have supplied as many as thirteen divisions, given the manpower that could have been recruited in Africa, but finally it provided eight, which meant that troops could be left in French North Africa. The C.E.F. counted nearly 115,000 men, 12,000 vehicles and 2,500 horses and mules. In addition a women’s contingent – the A.F.A.T. (Army Auxiliary Female Personnel) – was incorporated in the C.E.F. Thus France was the only country to fight in the Italian campaign with forces including women. From summer 1943, General Juin concentrated on equipping and training General du Vigier’s 1st Armoured Division, General Blaizot’s 9th Colonial Infantry Division (9th D.I.C.) and General Dody’s 2nd Moroccan Infantry Division (2nd D.I.M.) that were stationed in the Oranie region [north west Algeria] and in eastern Morocco. The undisputed superiority of the Allies could be seen in the technique of amphibious operations, an area in which the American marines, with their modern equipment, excelled. France, having been reduced to inactivity by the events of 1940, was very far behind. Juin, however, managed to revive the combative spirits of his men and in a few months the African Army was transformed from what it had been under the yoke of the Armistice commission. After the Salerno landings (operation Avalanche), Juin met Clark near Sorrento, Italy, on 29 September 1943. At Pompeii, in view of the slow progress of the British X Corps, particularly the 7th Armoured Division, in the Italian mountains, Juin reminded Clark that the French had experience of this type of terrain. Clark agreed, but only decided to use French troops at the end of November 1943, i.e. after the Teheran conference. Many French soldiers took offence at the way in which Juin was received, although Clark probably had no animosity or contempt for him. The lack of a welcome must probably be attributed to the difficult circumstances at the time. Clark had not yet taken any decision regarding the role that the French were to play. France, vanquished and occupied, was off the map in the reconquest of Europe. After the fall of Naples (1 October 1943), the Allies moved north towards the multiple defensive lines put in place by the Germans in autumn 1943. Allied progress was slow. The Germans were retreating, but at their own pace, destroying roads and bridges and causing floods, helped by the torrential autumn rain. 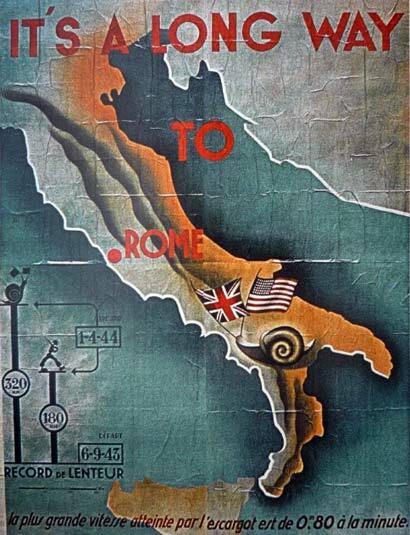 According to German propaganda, the British-American army was moving towards Cassino with a painful lack of speed and a poster appeared showing a snail crawling up the boot of Italy. Approaching the area around Cassino, on 1 December 1943, Clark launched the American VI Corps in order to take the heights that were occupied by the Germans between Cassino and Mignano. The Americans were about to have the bitter experience of mountain fighting in the Abruzzi massif. In particular, the American 34th Infantry Division was to fight to exhaustion in the Pantano massif. Clark, who had not forgotten Juin’s repeated requests, seized the opportunity to test the French army. General Dody’s 2nd Moroccan Infantry Division (2nd D.I.M.) thus received the order, on 13 December 1943, to take Monte Pantano and relieve the American 34th Infantry Division which had lost one thousand five hundred men (killed or wounded) attempting to seize this rocky peak 1,100 metres high, without success. Juin and Dody were convinced that a frontal attack would lead to nothing and that only by encircling the German position would it be possible to break through the enemy defences. Juin was therefore legitimately concerned for the 2nd D.I.M. Dody’s Franco-Moroccan force made little progress the first two days of fighting and failed to take the San Michele transverse valley. On 15 December 1943, General Lucas gave the order to the 5th Moroccan Rifle Regiment (Colonel Joppé) to launch a frontal attack and take Monte Pantano. After two days of fierce fighting against the formidable German 305th Infantry Division, Monte Pantano was taken by the Franco-Moroccan force. The victory came at a high price (8 officers and 47 other ranks were killed, with 248 wounded including 12 officers), but, it must be said, to the astonishment of the Americans, who had made no progress in two weeks at Pantano. This success increased Clark’s willingness to use French troops and he then ordered the 2nd D.I.M. to take Mt. Mainarde (1,478 metres) and the Monna Casale (twin peaks of 1,220 and 1,225), which they took from the Germans on 26 December and 29 December 1943 respectively. The 2nd D.I.M. was certainly forced to withdraw from Monna Casale due to the deterioration in the climatic conditions and a terrible snowstorm, but the success of the offensives conducted by Dody was indisputable. General Giraud went to the front to meet Clark and took advantage of the success of the 2nd D.I.M. to put forward the idea of entrusting the C.E.F. with their own operational assignment, an idea that was dear to Juin. Clark then ordered the C.E.F. to relieve the whole of the American VI Corps on its assignment in the mountains, as it was needed for the landings at Anzio (operation Shingle). The 2nd D.I.M. had lost nearly one thousand men at the end of 1943 (against the Germans’ three thousand), and was obliged to wait for the arrival of the Algerian 3rd Infantry Division (3rd D.I.A.) which was expected in January 1944. This division comprised 17,000 men, namely the 3rd Algerian Rifle Regiment (3rd R.T.A. ), the 7th Algerian Rifle Regiment (7th R.T.A. ), the 4th R.T.T., the 3rd Algerian Spahis Regiment and the 67th Artillery Regiment. Juin took command of operations on 3 January 1944. With the arrival of the 3rd D.I.A., the C.E.F. became a much more significant presence at the beginning of 1944. The C.E.F. began its advance into the Italian mountains and achieved all the objectives assigned to it by the Americans. Costa San Pietro and Monna Casale were taken on 12 January 1944, Monna Acquafondata and Monte Santa Croce on 13 January 1944, the Inferno and the Rapido on 17 January 1944. These C.E.F. achievements in January 1944 were the overture to the Battle of Belvedere.